When rain pours down, especially here in the UK, everyone is seen using an umbrella for protection from the heavy rain. Children want and need umbrellas just like adults; however they cannot use the larger umbrellas as they are heavy and quite dangerous for them to use. There are various kinds of kids umbrellas available in the market. New - Joules Junior Magic Unicorns Umbrella.. 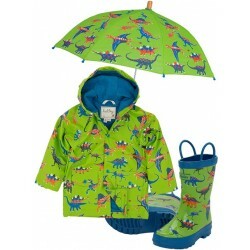 The umbrella finishes the outfit perfectly with a quality wooden handle and tip in a child-friendly ..